Her eleven-hour filibuster blocked the passage of a draconian abortion ban—and awakened a pro-choice sleeping giant. 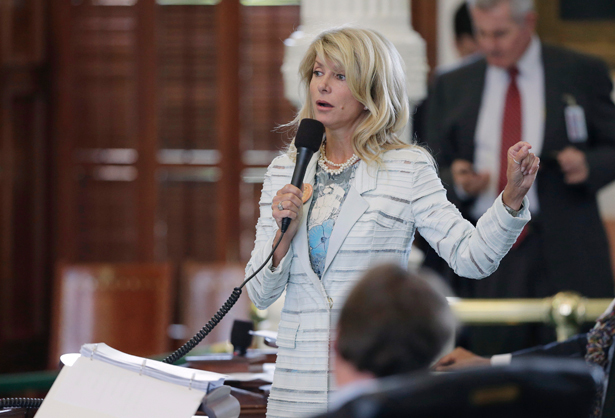 Wendy Davis is my hero. Make that my superhero. This brave and unbelievably stalwart legislator filibustered for nearly eleven hours to prevent a vote on SB5, a draconian bill that would ban abortion after twenty weeks and regulate abortion providers so severely all but five of the state’s forty-two clinics would be forced to close. Davis remained standing, unable to take a bathroom break, eat, drink, sit or even lean against a desk. She was polite and patient and calm and gracious, as Republican men condescended and patronized her, and said a lot of ridiculous things that showed they knew very little about women’s bodies or lives. For hours, she read eloquent and deeply personal letters from Texas women who had had abortions. For hours more, she minutely and knowledgeably dissected the problems with SB5. Not that the Republicans were listening. Finally, she was forced to stand down, after she was deemed to have done three things that were not “germane”—she allowed a colleague to help her with her back brace (so much for southern chivalry! ), she discussed Planned Parenthood and she talked about the state’s mandatory ultrasound law. Suddenly Planned Parenthood and mandatory ultrasounds are not “germane.” Never mind that Texas Republicans have spent considerable energy defunding Planned Parenthood as a hotbed of abortion and heaping up ultrasound requirements precisely in order to make abortion harder to get. At that moment, an amazing thing happened. The other heroes of the night swung into action—the hundreds of abortion rights supporters who thronged the capitol cheered Davis and van de Putte so loudly and for so long that the vote missed the midnight deadline. Even for those of us watching on line—150,000 around the world—this was a profoundly heart-stirring moment. My friend Rebecca Traister compared it to the singing of “La Marseillaise” in Casablanca. The missed deadline did not prevent someone (who?) from falsifying the time clock to make it appear the vote took place before the midnight cutoff. Thank you, Internet, for screen shots that proved what had really happened. At 3 am, Dewhurst announced the bill was dead. Very likely, Governor Perry, a true believer in the anti-choice cause, will call another special session to push SB5 through. And very possibly, thanks to the Supreme Court’s evisceration of the Voting Rights Act, Wendy Davis will be redistricted out of office ASAP. But beyond whatever losses are to come, it’s possible to glimpse something more important: the awakening of that famous pro-choice sleeping giant we’ve heard so much about. Lawyers and advocates and politicians and lobbyists are terribly important, but in the long run they can’t preserve our rights if pro-choicers themselves are complacent. Last night it looked like there’s not much chance of that in Texas. Allons enfants! Show your appreciation for local activists by making a donation to the Lilith Fund, which helps low-income women pay for their abortion care. While Wendy Davis was defending women’s rights in Texas, President Obama gave a speech outlining his climate change plan at Georgetown University.